Located within 3.6 km of Old Trafford Stadium in Manchester, Abbey Lodge offers accommodation with free WiFi. A continental breakfast is available every morning at the property. Guests can relax in the garden at the property. University of Manchester is 5 km from the bed and breakfast, while Bridgewater Hall is 5 km away. The nearest airport is Manchester Airport, 11 km from the property. Located in Manchester, Albert View provides accommodation within 2.2 km of Chetam's Library. Free WiFi is provided. The units have a fully equipped kitchen with a microwave and a fridge. Manchester Arena is 2.5 km from the aparthotel, while Royal Exchange Theatre is 2.6 km away. Manchester Airport is 18 km from the property. Located in Manchester, Arena House features accommodation with access to a garden. Complimentary WiFi is available. All units are equipped with a dishwasher, microwave, a coffee machine, a toaster and kettle. There is a shared bathroom with bath in all units, along with free toiletries and a hair dryer. City of Manchester 'Etihad' Stadium is 1.5 km from the bed and breakfast. The nearest airport is Manchester Airport, 17 km from Arena House. Brynden House is situated in Manchester and features a garden. 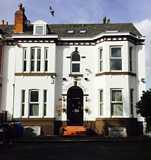 The property is around 2.9 km from Fletcher Moss Botanical Gardens and 5 km from Victoria Baths. The property is set 5 km from University of Manchester. The rooms in the guest house are equipped with a kettle. The rooms come with a shared bathroom with a bath. All rooms will provide guests with an oven. The Palace Theatre is 7 km from Brynden House, while Manchester Apollo is 7 km away. The nearest airport is Manchester Airport, 12 km from the property. Enjoy the convenient location and the warm hospitality of the New Central Hotel, Cheetham, Manchester, offering guests affordable 3 star bed & breakfast accommodation in a family run establishment. The New Central Guest House is a family-run B&B in a quiet suburb 3 km north of the city centre. It has free Wi-Fi and free parking on site. New Central Guest House is about 1 mile (1.6 km) from Manchester Victoria Train Station. There is a guest lounge with TV and internet access, and some bedrooms have a view of the park. Offering free WiFi, Central Northern Quarter Apartment is set in Manchester, within 600 metres of Greater Manchester Police Museum. Attractively situated in the Manchester City Centre district, the property is situated 1.8 km from Canal Street and 1.8 km from Manchester Arena. The property is 2 km from the city Manchester City Centre. Guest rooms in the guest house are equipped with a kettle. All rooms include a private bathroom with a bath or shower, free toiletries and a hair dryer. The units feature a wardrobe. Chetam's Library is 2.1 km from Central Northern Quarter Apartment, while Manchester Central Library is 2.3 km away. The nearest airport is Manchester Airport, 16 km from the accommodation. Set 1.8 km from University of Manchester, Elegant Stay features accommodation with free WiFi in Manchester. This 4-star guest house offers a shared lounge. The property is 2.4 km from Victoria Baths. Every room includes a shared bathroom with free toiletries and a hair dryer. The guest house offers a sun terrace. The Palace Theatre is 3 km from Elegant Stay, while Manchester Central Library is 3.4 km away. The nearest airport is Manchester Airport, 12 km from the accommodation. Located in Manchester, Elton Bank Hotel offers a bar. Around 1.8 km from University of Manchester, the hotel is also 1.6 km away from Manchester Academy and offers free WiFi. The property is situated 1.8 km from Manchester Museum and 1.9 km from Royal Northern College of Music. All units at the hotel are fitted with a kettle. Selected rooms also boast a kitchenette with a fridge. A Full English/Irish breakfast is available every morning at the property. Manchester Arena is 2.9 km from Elton Bank Hotel, while Manchester Central is 3.2 km from the property. Manchester Airport is 10 km away. Gorton Mount Hotel Manchester is located in Manchester, 3.1 km from Victoria Baths. Located around 3.5 km from Manchester Apollo, the hotel is also 4.1 km away from City of Manchester 'Etihad' Stadium. Both free WiFi and private parking are available at this property. All units in the hotel are fitted with a kettle. Rooms are complete with a shared bathroom, while some rooms at Gorton Mount Hotel Manchester also boast a seating area. Canal Street is 5 km from the accommodation, while Greater Manchester Police Museum is 5 km away. The nearest airport is Manchester Airport, 16 km from Gorton Mount Hotel Manchester. Located within 1.4 km of Victoria Baths in Manchester, Regency Guesthouse Manchester features accommodation with free WiFi. Some units also have a kitchenette equipped with a microwave and a toaster. Manchester Apollo is 2.4 km from the bed and breakfast. The nearest airport is Manchester Airport, 13 km from the property. Featuring free WiFi, St Anns Square Apartments is set in Manchester, 300 metres from Deansgate. The Opera House is 600 metres from the property. All units have a dining area and a seating area with a flat-screen TV. There is also a kitchen, fitted with a dishwasher. An oven, a microwave and toaster are also featured, as well as a coffee machine and a kettle. Each unit comes with a private bathroom with bathrobes and free toiletries. Towels are offered. The property has a 24-hour reception desk. G-MEX Centre is 600 metres from St Anns Square Apartments. Manchester Airport is 14 km away. Set in Manchester within 700 metres of Canal Street and less than 1 km of The Palace Theatre, The Bulls Head Hotel provides rooms with free WiFi. Set in Manchester within 700 metres of Canal Street and less than 1 km of The Palace Theatre, The Bulls Head Hotel provides rooms with free WiFi. Located around a 14-minute walk from Manchester Central Library, the hotel is also 1.3 km away from Manchester Apollo. The property is situated in the Manchester City Centre district and Manchester Central is 1.4 km away. All guest rooms in the hotel are equipped with a TV. Rooms are equipped with a private bathroom with free toiletries and a hair dryer. Bridgewater Hall is 1.5 km from The Bulls Head Hotel, while Deansgate is 1.7 km from the property. The nearest airport is Manchester Airport, 15 km from the accommodation. The Granary is a converted barn situated behind our 17th Century Manor House set on an arable farm with connections to Oliver Cromwell. The Granary is set in Salford, 11 km from Milton Keynes and 30 km from Northampton. Free private parking is available on site. Each room is fitted with a flat-screen TV and DVD player. You will find a kettle in the room. The Granary features free WiFi throughout the property. Luton is 22 km from The Granary, while Watford is 45 km away. The nearest airport is London Luton Airport, 24 km from The Granary. Situated less than 6 miles from Manchester city centre, The Old Station House Hotel features free WiFi and a free secure car park. Each room at The Old Station House Hotel comes with an en-suite bathroom, a flat-screen TV and tea/coffee making facilities. The on-site restaurant offers an � la carte European menu, a traditional Sunday roast and a lunch menu. An extensive wine list is also on offer. Manchester city centre is home to a wide variety of nightlife, shops and museums. Legoland Discovery Centre and The Trafford Centre are just a 20-minute drive away. A 5-minute drive from Manchester city centre, this family run B&B overlooks Whitworth Park, and offers free Wi-Fi throughout the building. Set in Manchester within 2.2 km of Chetam's Library and 2.5 km of Manchester Arena, kempster garden large private room with en suite in modern spacious 3 bed house offers rooms with free WiFi. 2.5 km from Royal Exchange Theatre, the guest house features a garden and a shared lounge. The Opera House is 2.7 km away and John Rylands Library is 2.9 km from the guest house. All units in the guest house are fitted with a kettle. The rooms come with a private bathroom with a shower and free toiletries. The units will provide guests with a dishwasher. Manchester Central Library is 3.3 km from kempster garden large private room with en suite in modern spacious 3 bed house. Manchester Airport is 18 km away.